Despite significant regional government aid, the north of England and Wales lag the south in output per person, educational attainment, and other social indicators (e.g. Crafts 2005, Geary and Stark 2015, 2016). Value added per person is more than 40% higher in the south. The fraction of 18 year-olds winning admission to Oxford or Cambridge is double in the south. 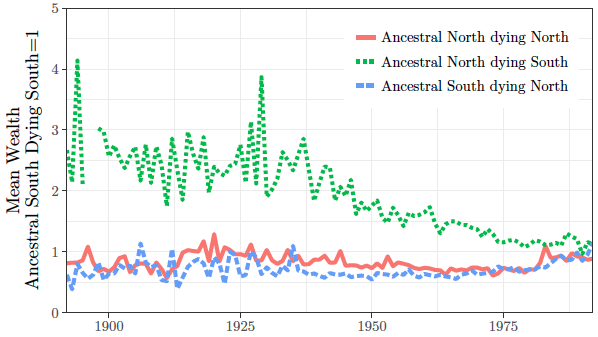 Using information on surnames that were northern (including Welsh) or southern in origin in pre-industrial England, in a recent paper we show that the decline of the north is entirely a product of the sorting of migrants by ability into a high-ability south and low-ability north over the last 200 years (Clark and Cummins 2018). Migrants out of the north have had high abilities, and migrants into the north low abilities. As a consequence, those of northern English origin– as opposed to those still living in the north – show no disadvantage in outcomes at the national level in modern England. The disadvantages observed among those still in the north are completely compensated by the advantages seen among those with northern surnames in the south, where they are an elite. The policy implication of this finding is that despite poorer social outcomes, those living in northern England and Wales do not face social or economic disadvantages relative to those living in the south. Thus, government expenditures designed to compensate for any perceived northern or Welsh disadvantage represent a misallocation of resources. Nor should universities take any steps to specifically raise enrolment from the north or from Wales. The lack of national-level disadvantage to those with northern surnames implies moves to encourage more migration to the south, as advocated by Leunig and Swaffield (2008),would also be a mistake. If performance is improved by people moving south, then at the national level the northern surnames which are still concentrated in the north would be disadvantaged with respect to educational status, occupational status, and wealth. They are not. Thus the concentration of education and talent in the south is not associated with significant external benefits, as would be predicted by the doctrines of the New Economic Geography (e.g. Krugman 1991, Krashinsky 2011). The regional sorting by economic ability within England has not had adverse economic effects at the national level. The poor performance economically and socially of northern England and Wales in recent years does not represent any missed economic or social opportunity. 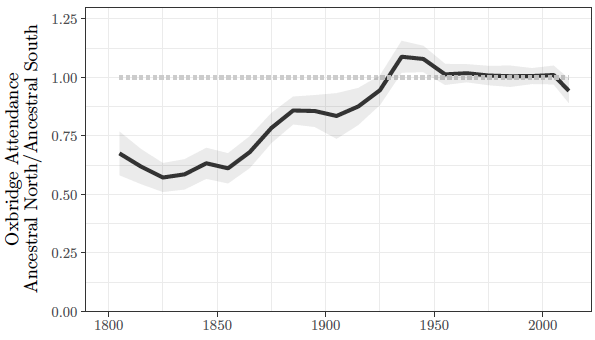 As an illustration of the claim of no disadvantage from northern origin, Figure 1 shows the ratio of enrolment rates at Oxford and Cambridge by decade between 1800–2016, for northern versus southern surnames. Since the 1930s, northern surnames enrol at as high a rate in Oxford and Cambridge as southern surnames, even though the majority of holders of such surnames reside in the north. There is thus no national disadvantage in educational attainment for northern surnames. If for students of given ability there was a geographic disadvantage in chances of enrolment in Oxford or Cambridge, then since northern surnames are still concentrated in the north, they would reflect that disadvantage. For registered doctors in the UK there is a similar lack of any disadvantage in registration rates by surname for northern surnames. Note: shaded band indicates 95% confidence interval. 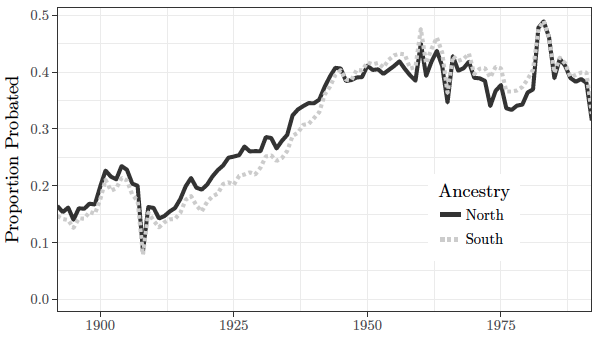 Figure 2a shows the probate rates 1892–1992 of adults dying in the north of England or the south. These probate rates measure the share of each population dying with significant wealth. As can be seen, probate rates in the north are consistently below those of the south. 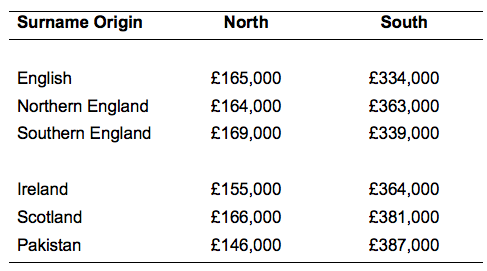 However, as Figure 2b shows, probate rates for northern surnames are on average very similar to those for southern surnames between 1892–1992. The implication again is that northern names suffer no national disadvantage in economic outcomes. Instead northerners in the south must be wealthier than southerners in the south. This is confirmed in Figure 3 which shows estimated mean wealth at death by location at death and surname origin. Northerners dying in the south were significantly wealthier than southerners dying in the south throughout the years 1892–1992. An illustration that the north has tended to attract less economically successful migrants comes from house values implied by the location of voters of different surname types in the 1999 voter roll. In southern England, those with surnames of southern English origin tended to live in poorer areas than migrants from northern England, Ireland, Scotland, and Pakistan. In contrast, in the north, southern English migrants were not living in wealthier areas than the adversely selected population of northern origin. Note: Those dying in the south with a southern surname set to 1. Those whose origins trace in part to Ireland, Scotland, or Pakistan were typically living in even poorer areas than the adversely selected northern English population. Thus there was sorting of the economically able to the south both for internal migrants within England and Wales and even more strongly for external migrants to England. Note: Average house prices by postal code in 2015. The economic decline of the north of England and Wales has been regarded by many policymakers as a market failure that requires government intervention to correct. Part of the justification for the huge proposed expenditures of HS2, for example, have been the need to revive the economy of the north. We show using the evidence of surname origins, however, that the decline of the north is purely a product of regional sorting by economic ability, and not the consequence of any market failure. The northern population, given its characteristics, is doing as well as the equivalent population in the south. There is no regional problem requiring solution in England. One further implication of our study is that there is no evidence in England for significant human capital externalities, as posited by the New Economic Geography. There is no evidence that the productivity or educational attainment of workers of a given inherent characteristic benefits when that worker is located in the high education south as opposed to the low education north. 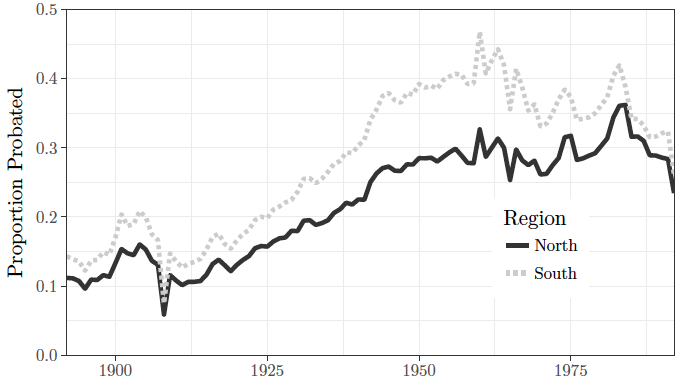 Clark, G and N Cummins (2018), “The big sort: Selective migration and the decline of Northern England, 1780-2018”, CEPR, Discussion Paper 13023. Crafts, N 2005, “Regional GDP in Britain: Some estimates”, Scottish Journal of Political Economy 52(1): 54–64. Leunig, T and J Swaffield (2008), Cities unlimited: Making urban regeneration work, Policy Exchange. Geary, F and T Stark (2015), “Regional GDP in the UK, 1861–1911: New estimates”, Economic History Review 68(1): 123–144. Geary, F and T Stark (2016), “What happened to regional inequality in Britain in the twentieth century?” Economic History Review 69(1): 215–228. Krashinsky, H (2011), “Urban agglomeration, wages and selection: Evidence from samples of siblings”, Labour Economics 18(1): 79–92. Krugman, P (1991), “Increasing returns and economic geography”, Journal of Political Economy 99(3): 483–499.